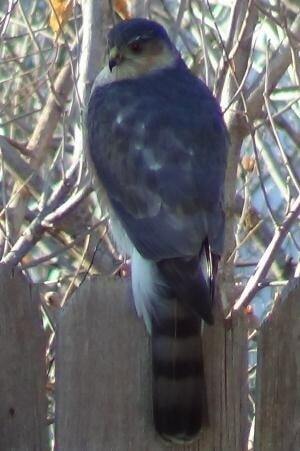 The first time I had a close up view of a Coopers Hawk was in winter. I went out to fill my bird feeders and saw him on the shepherd's hook where the feeders were hung. He wasn't there for the seed I was serving; instead, he was there to capture the small songbirds that are attracted to the seed. The raptor allowed me to get quite close before flying away. Almost too close. The birds talons were visible enough to command respect from any would be predator or prey. 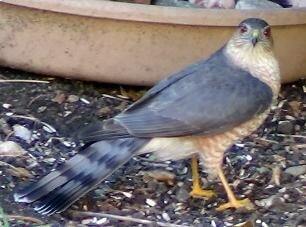 I believe this bird has been returning for several winters now. The Cooper's Hawk is about 14 to 20 inches long with a wingspan that can measure 2 1/2 feet wide. Short wings and a long rounded tail helps this bird fly through wooded areas with ease. The back is slate gray, the tail has several black bands and the tip has a white band that is broader than the Sharp-shinned Hawk. The bright yellow spot at the base of its gray bill along with its dark red eyes are hard to miss. The female is similar in appearance but is larger than the male. Juveniles have brown backs with brown streaks on their breast and bright yellow eyes. Courtship habits include flight displays and the male bowing around the female. This may give the message that he is ready to nest. Pairs are monogamous but do not mate for life. Some pairs may re-mate but most will find new mates each season. There is a pre-incubation period where the female stays in the nest stand all day. This may last a month. During this time the male will stay with her, leaving only to hunt for food. The male will feed the female about three times a day, each time copulating with her. The male Cooper's Hawk migrates first to the breeding grounds and it's speculated that he chooses the nesting site. However, there are no studies that prove this theory. Nest sites are can be anywhere from 25 to 65 feet in a tree. Nest are placed in the crotch of the tree or where the trunk and a horizontal branch meet. While mostly building new nest each season they will occasionally reuse a nest or take over an old squirrels nest. The nest is cup shaped and made from twigs and small branches. The inside is lined with bark. The female will lay her eggs every other day and averages 3 to 4 eggs in a clutch. The female does most of the incubation while the male feeds her on the nest. Incubation last from 34 to 36 days. The female will brood the young for about two weeks. The male brings her food and she will tear it and feed it to the young. The young will be able to tear the food for themselves when they are about 2 1/2 to 3 weeks of age. The young will leave the nest 28 to 32 days after hatching but will return to the nest for some time after leaving. Within 2 months the young will become independent and no longer need their parents. Cooper's Hawks will feed on many different bird types. Some of these include Juncos, Robins, Jays, and others. They will also eat small squirrels mice, lizards, and insects. Studies show that most of their prey is made up of first year birds and mammals which makes sense, they are not as knowledgeable as older birds and mammals. While they sometimes soar, most of their hunting is done by travelling specific routes and sitting on perches while they survey the area. This bird is known to take Purple Martins as they fledge right out of the air. They also attack adult Martins suprising them by using trees and human homes to ambush the birds. While this hawk migrates, it is usually replaced by other's Coopers farther North, moving South.